(3) Hold the flattened candle by its tip and base and gently twist it. There are several ways you can prepare your wick for dipping. You can cut pieces of wick and tie them to a wooden spoon. You can bend the wick in two and hold it at the bend while dipping, or use the method I prefer, as depicted to the right. Since the wicks are attached to the wooden spoon, you don’t need to have your hand directly over the candle wax. Doubble boil your wax With the wick tied to the wooden spoon handle, dip it once into the pot with the wax. 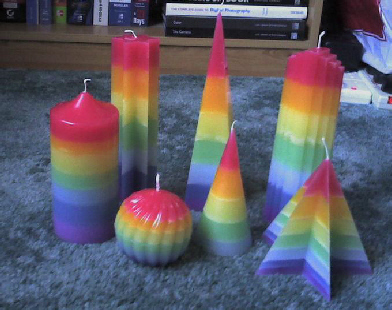 This is what your candles should look like after 5 dips, like .. This is what your candles should look like after 10 dips. This is what your candles should look like after 20 dips.The candles will still feel warm to the touch. After you have dipped your candles 25 dips you are done this part of the candlemaking process. Cut the candles off of the wooden spoon from which they are hanging. Trim the wick to 1/4″. Roll the candle in wax paper while it is still warm. To give you and idea of what your candles could look like, the candle on the left is finished by rolling it in wax paper.The candle on the right is left as is giving it a more rustic look. Using a pair of scissors or a sharp knife, trim the bottom of the candle to make a flat and finished end. Handmade candles make wonderful and thoughtful gifts. Your friends and family will appreciate the time you take to create a special gift just for them in mind. Below you will find everything you will need to create your own candles. Put your wax into pour pot. First you will need to figure how much wax you should use for candle making by filling your mold with water, measure how much water it held, then add 3 ounces of wax per each 31/2 ounces of water. Add a couple inches of water to your boiler. Place your pouring pot with wax into boiling water. Turn heat source down to let water simmer, you don’t want to allow any water to splash into your wax. Replace water in boiling pot as needed, you never want pot to boil dry. Use your thermometer to keep check on the temperature of your wax, never allow thermometer to touch bottom of pan. You are aiming for 175-180 degrees. Insert the wick through the small hole at the top of the mold and pull it all the way through. Secure the wick by wrapping around a pencil, toothpick or wick support, at the bottom end, and fill the small hole with plumbers putty, press the sealer firmly in place to prevent the wax from leaking out. If you are using additives add them when wax reaches 175-180 degrees.3 TBS stearic acid and 1/2 tsp vybar to 1lb wax, therefore if you are using an 8 oz mold you should use 1.5 TBS vybar and 1/4 tsp vybar. After your additives have completely dissolved, add your color. Remember it will be best to start off with a little color and keep adding a little at a time until you reach your desired color. Next add your fragrance oil. 1 ounce oil to 1lb wax, stir gently for about 2 minutes, or until everything is dissolved. You might want to heat a metal mold before filling with wax. You can do this by placing in oven on a low setting for short amount of time.Then use your pouring pot to pour wax into your mold. Save some of this wax for a re-pour in a later step. Tap sides of mold several times, as the wax sets, to release any air bubbles. When the wax reaches a tacky consistency, you will need to poke a few holes in the candle, these holes should be about 1 inch less the depth of the candle. You may need to poke holes several times during the cooling process. Cool to room temp. As the wax cools it will shrink, so this is when you need to use the wax you saved earlier. You will need to re-heat this wax, then pour, to just below the level of your first pour. You might need to even out the bottom to make it smooth, to do this you will need to place your candle on a cookie sheet, then place on top of a pot of boiling water. As individuals begin making candles there is a series of basic questions and decisions that are made. They include (but are not limited to) what types of candles to make, which wax to use, fragrance selection and where to make the candles. One of the most commonly overlooked aspects of candle making is the actual “process” of making candles. While all of these decisions are made with the intent of producing consistent and quality candles, the process of making candles is often as important as any other aspect.When people talk about real estate, the phrase “location, location and location” certainly is a reoccurring theme. In candle making the key phrase has to be “temperature, temperature and temperature. ” This refers to the temperature at which you pour the wax, the room temperature and the temperature of the mold and or container you are pouring the wax into.The pouring temperatures for each of the waxes you may use are best determined by following the manufacturer’s recommendations. No matter what type of candles you are making, paraffin, gel and/or natural waxes, the pouring temperature is very important. When using quality waxes, pouring hotter can produce better results. But this should only be done when first trying the manufacturer’s recommended pouring temperatures. In some instances such as with the J-50, J-223 and the natural waxes, it is advisable to pour at lower temperatures to produce the best results. While candles can be poured in most rooms year round, it is best to try to control the room temperature as much as possible. Rooms that are warm and humid require different pouring temperatures than rooms that are cold and damp. The only way to determine which is acceptable for your room is to pour several candles and analyze the results. It is not unusual to experience different results in your candles as the temperatures in the room change throughout the year. In many instances when the temperature begins to get cool it may be necessary to pour a little hotter than you would during the summer months. The more you can control the year-round temperature in the room, the easier it will be to get consistent results. The preheating of the container or mold is directly related to both your pouring temperature and the room temperature. For best results consistently it is advisable to preheat the container or mold to take away any moisture or “chill” that may exist. If you are pouring hotter, you may be able to reduce the amount of preheating required. Some companies have developed procedures where they merely pour hotter and reduce the preheating required. 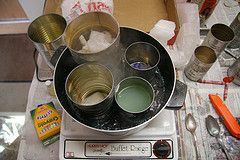 The preheating of these molds or containers should be done with a dry heat (heat lamp or heat gun) and not by hot water. The hot water will actually introduce moisture and have a reverse effect, which can cause air pockets to develop. In addition to temperatures, it is also important to develop consistent procedures for measuring the various items being placed into your formulation. Wherever possible it is advisable to measure all of your additives, scents and color by weight and not necessarily by teaspoons or tablespoons. Certain additives such as vybar are very effective, but being off of the formulation just a little can change the results of the finished candles. If you are looking for consistent “looks” in your pillars, it is important to try to use the same type of mold in as many instances as possible. The type of mold, aluminum, tin and or polycarbonate can produce different finishes on your candles. One nice thing about candle making is that there really is no wrong or right way to make candles if the end result is a safe burning and desirable looking candle. However, the key to make consistent candles is to try to develop consistent procedures taking into account many of the points identified in this article. Many candle companies have developed their most popular candles by mistake or experimenting.